Comet U1 NEOWISE—a possible binocular comet? 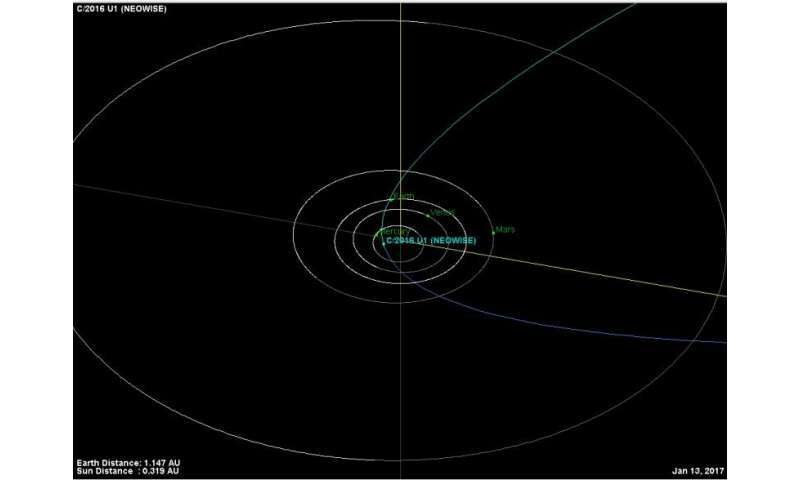 Well, it looks like we'll close out 2016 without a great 'Comet of the Century.' One of the final discoveries of the year did, however, grab our attention, and may present a challenging target through early 2017: Comet U1 NEOWISE. 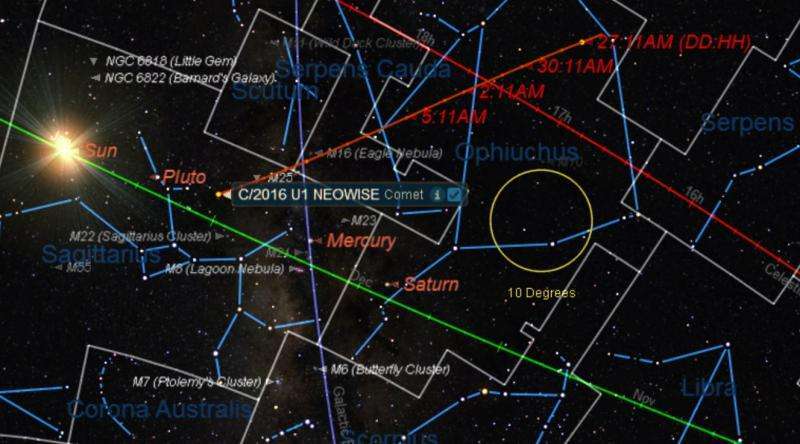 Comet C/2016 U1 NEOWISE is expected to reach maximum brightness during the second week on January. Discovered by the Near-Earth Object Wide-field Infrared Survey Explorer (NEOWISE) space observatory on its extended mission on October 21st, 2016, Comet U1 NEOWISE orbits the Sun on an undefined hyperbolic orbit that is perhaps millions on years long. This also means that this could be Comet C/2016 U1 NEOWISE's first venture through the inner solar system. Comet C/2016 U1 NEOWISE is set to break binocular +10th magnitude brightness this week, and may just top +6th magnitude (naked eye brightness) in mid-January near perihelion. 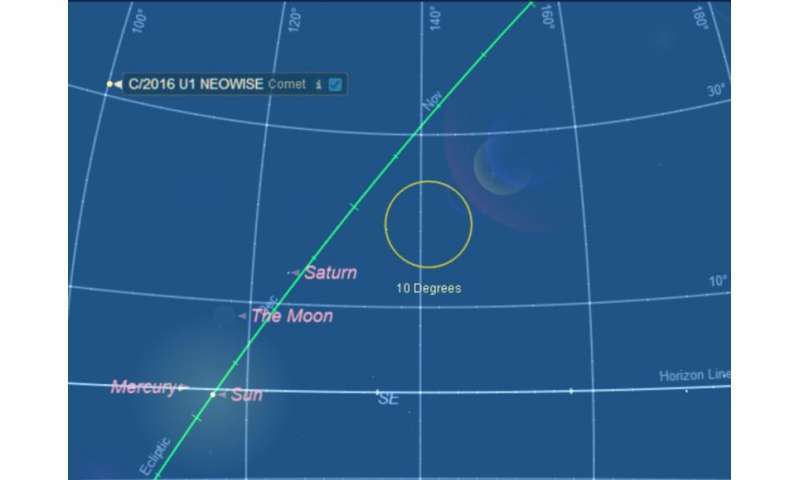 The time to try to catch a brief sight of Comet C/2016 U1 NEOWISE is now. 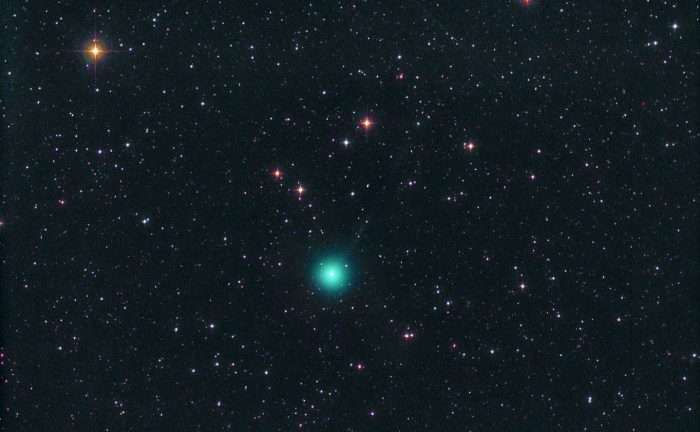 Recent discussions among comet observers suggest that the comet may be slowing down in terms of brightness, possibly as a prelude to a pre-perihelion breakup. Keep a eye on the Comet Observer's database (COBS) for the latest in cometary action as reported and seen by actual observers in the field. C/2016 U1 NEOWISE was one of 50 comets discovered in 2016. Notables for the year included C/2013 X1 PanSTARRS, 252/P LINEAR and C/2013 US10 Catalina. What comets are we keeping an eye on in 2017? Well, Comet 2/P Encke, 41P/Tuttle-Giacobini-Kresak, C/2015 ER61 PanSTARRS, C/2015 V2 Johnson are all expected to reach +10 magnitude brightness in the coming year… and Comet 45P/Honda-Mrkos-Pajdušáková has already done so, a bit ahead of schedule. These are all broken down in our forthcoming guide to the top 101 Astronomical Events for 2017. Again, there's no great naked eye comet on the horizon (yet), but that all could change… 2017 owes us one!